First Nations’ Emergency Services Society of British Columbia (FNESS) is incorporated under the Society Act of British Columbia. Our mission is to assist First Nations in developing and sustaining safer and healthier communities by providing the programs and services described in this website. Please feel free to contact us if you have any questions. 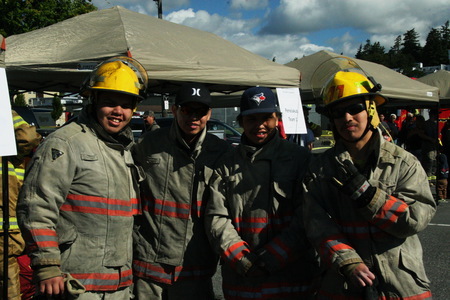 FNESS evolved from the Society of Native Indian Fire Fighters of BC (SNIFF), which was established in 1986. SNIFF’s initial objectives were to help reduce the number of fire-related deaths on First Nation reserves, but changed its emphasis to incorporate a greater spectrum of emergency services. In 1994, SNIFF changed its name to First Nations’ Emergency Services Society of BC to reflect its growing diversity of services provided. Today our organization continues to gain recognition and trust within First Nations communities and within the Department of Indigenous Services Canada (DISC) and other organizations. This is reflected in both the growing demand of service requests from First Nations communities and in the devolvement of more government-sponsored programs to FNESS. First Nations’ Emergency Services Society believes in treating our membership, staff, clients, consultants and external organizations with integrity, respect, fairness and honesty. Through leadership and wisdom, FNESS believes in recognizing the cultural diversity of all those involved. Working as a team to deliver programs, we are committed to being an open, credible, sincere and trustworthy organization. The FNESS logo was designed in 1986 by artist Tom Stewart of Kitimat, BC at the age of 15. The logo represents the vision of a firefighter. The iris of the eye portrays the legendary fire moon spewing water onto the eye of the fire. The circle represents First Nations. Courage: Strength and curiosity while determining the most beneficial actions with communities. Honesty: Open and transparent environments in all actions. Integrity: Consistent and accountable for all actions, assessing and adapting as needed. Passion: Acknowledging enthusiasm and initiative; rewarding success regularly. Respect: Inclusiveness and teamwork that allows fairness, balance, and harmony in all activities; appreciative of all cultural diversities. Trustworthiness: Providing credible and state-of-the-art recognized services.